Sellier was up for it though, and got into ‘the zone’. Lots of applause, nice ‘personality’ pics, run the 40 lapper and go for a Carib. Massie and Chiappa fox with each other. But Sellier hadn’t read my copy and came back late in the second match, when he was one ride down, after Chiappa out jumped him. To all the observers – and both riders, it looked like Sellier hadn’t quite made it and Chiappa had won 2-0. The judges thought different and ordered a re-run because they couldn’t separate the two fast men. Chiappa was none too chuffed by this decision and with much gesticulation, Roberto announced he was going home. ‘Do you believe you won, Roberto,’ I asked the Italian; ‘Sellier even said I won!‘ he replied. Bike shouldered, Roberto walks into a storm. Ma, is simple – I won! Peter, as Euro Manager had to attempt to placate the irate Latino – who did his best to poke a hole in Pete’s chest with his index finger – not to mention negotiate with the organiser and try to get the judges to change the decision. Pete tries to negotiate a settlement. The third ride to decide the race, but someone’s missing. So, what was I going to say? … Oh, yeah. Last night it was punctures, tonight it was crashes – or rather one crash; but it was a bad one. Pittsburgh prime snaffler from last night, Dan Kowalcik and German Six Day flyer Leif Lampater both made hard contact with the rough iron hard sand paper that it is the concrete surface of the Arima track. Leif in a bit of a mess, he’ll be sore for a few days. Zak was whisked off to hospital, whilst Leif had his abrasions cleaned, sprayed with plastic skin and sat down to wait for nature to do it’s work – unfortunately, that takes longer than the duration of a track meet. But Zak was strechered off – that’s gotta be worse. The lads take their road bikes to the track. Arima is much more recognisable as a conventional track than San Fernando – 465 metres, concrete with decent bankings. Unlike San Fernando, there were no huge puddles in the track centre – but there was a lovely cool breeze off the hills, taking the humidity away and feeling soft on the skin. No mechanics here, and Pete does the necessary. At the 16:00 kick off there wasn’t much of a crowd, but by the time 20:00 rolled around, the stands were packed. 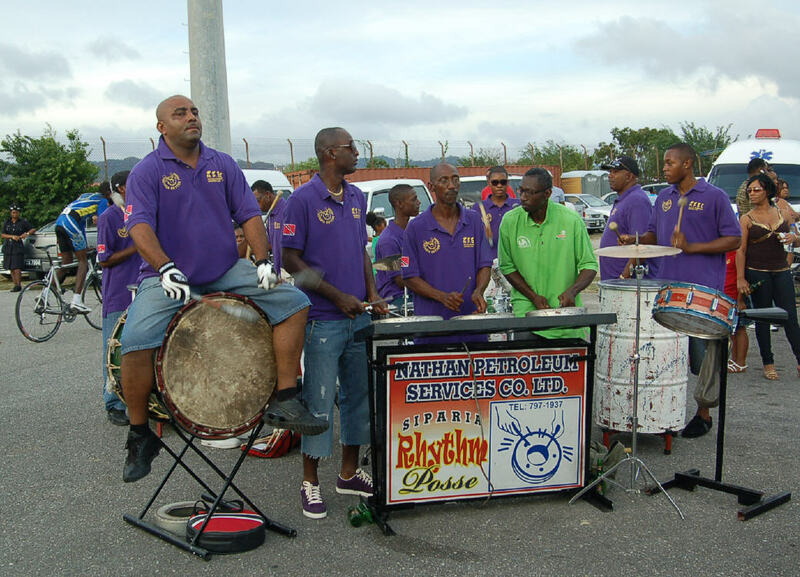 A Trinidadian track meeting is a bit like a Grateful Dead concert – nobody is really sure how long it will take; but it ain’t going to be over any time soon. On the rest of the island, Sunday is quiet, all the shops and cafes are shut, albeit some bars are open. Dem Trinidad guys need their Carib beer – Richard Dickie reckons there should be a Carib bottle logo included in the national flag. It would make a great national flag, wouldn’t it? And the patriotic news is that virtually every shop and bar stocks Tunnocks Caramel Wafers – a little touch of Uddingston in the Tropics. Match sprinting; you either love it or hate it; I love it – but first you have to qualify. Roberto Chiappa demonstrated that despite the fact he won his first Worlds medal as a junior at the Junior Worlds in Middlesborough in 1990 – he’s far from finished. 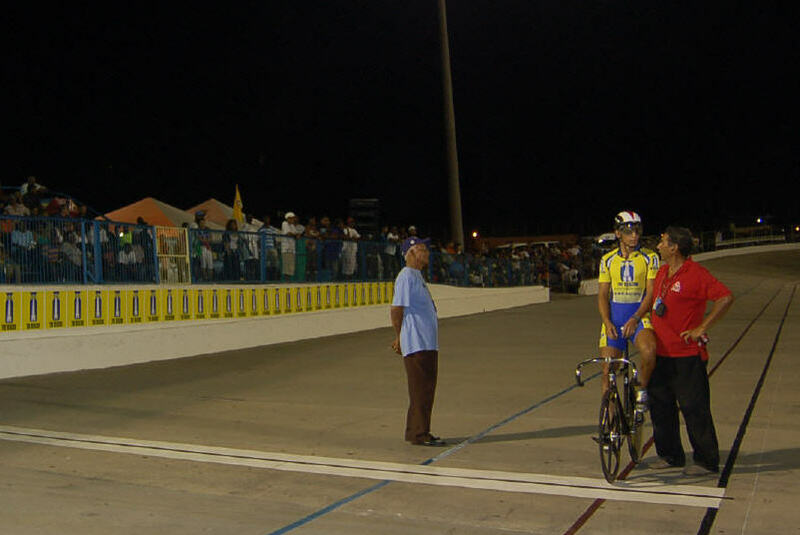 He was way clear in the flying 200 metres time trial with 11:06 – a track record and faster than Franco had predicted for the rough concrete oval. Roberto was in better spirits earlier in the evening. The other three qualifiers were Canadian champ Stephane Cossette (4th), US champion Giddeon Massie (3rd) and fastest sprinter Home Boy, T&T champion, Christopher Sellier. After the sprint qualifications it was the All Star 12 lap – interrupted whilst the unfortunate Zak and Leif were attended to. At the restart, it was former Hamish Haynes room mate, Emile Abrahams who had most finish speed. The riders get to relax and have a laugh too. Here, Walter has a devil of a time. ‘Muller stole the bell! Muller stole the bell!’ hollered Ronald Dickie, the speaker – he alone was meant to know the number of laps for the ‘ladies unknown distance,’ but Andreas made off with the bell and brought the race to a premature end. The ‘voodoo’ drums provided the backbeat. The sprinting was good; fast and exciting – but you already know about that. The devils were out again; but Andreas Muller out foxed them. 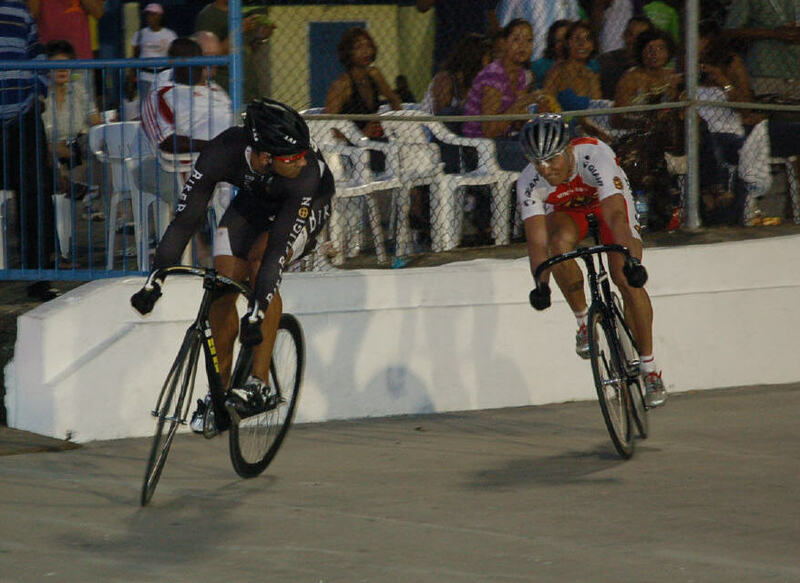 The 1500 metres went to Trini road champ Adam Alexander, who was also third in the Savannah criterium. After the sprint dramas, the 40 lap could have been a damp squib; but Mister Marvulli made sure it was no such thing. The race ebbed and flowed early, no break could stick and the Euros definitely missed Leif; who was not surprisingly sitting the last dance out. With maybe a dozen laps to go, Franco took off, one of the young Trini guys went with him but couldn’t spell. The US and Canadian riders chased but there was no organisation and the big Suisse just wasn’t giving in. The Canadians go for it. With three to go, the Canadian, Lachance launched a huge jump from the group, made it up to Franco but then made the big mistake. Instead of sitting on and recovering, even for a few moments, he went over the top on his own. Franco was too smart to try to respond, he knew it was too far for the Canadian to go on his own. As the man in the maple leaf began to fade, Franco launched, caught the Canadian and took the big money for the second night. All this money is for me? It was a terrific finale; and an early finish – jeez, it wasn’t even 11:00 pm. 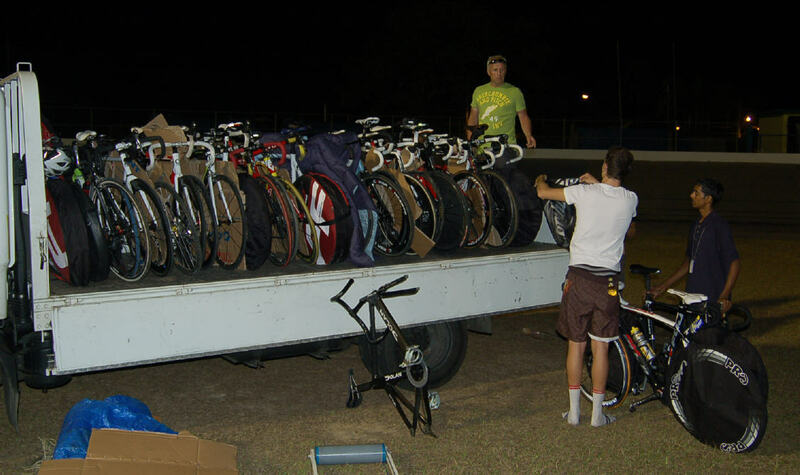 Not finished work yet, Pete has to load the truck for the tired riders.